Solidago flowers are best known by the common name of goldenrod. This sunny perennial often receives mixed approval for gardens. In some areas it is considered an invasive weed species and removed. They are popular flowers for bees and produce blooms that are edible. Honey is also made from these plants, making it valuable for food. Some species also produce large amounts of nectar when grown properly. They also tend to be sold as additional accents on cut flower arrangements in locations around Indio, CA, Davenport, IA, Round Rock, TX, Lafayette, LA, and Hollywood, FL. They hold a positive connotation for "feel better" arrangements"; this is highlighted further in a section below. S. shortii, known as Short's Goldenrod, is considered to be very rare. There are only two locations known for this particular species. It is considered to be critically endangered and is highly protected. As these plants do not self pollinate it can be difficult to spread. Cross pollination is achieved through the use of insects on plants. Seeds are also produced but may not successfully take in the ground. S. canadensis is more commonly known as the Canadian Goldenrod. 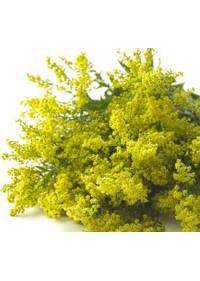 Flowers are in clusters on long arching stems and are a soft yellow. It is often used as fodder for livestock and is also eaten by deer. Solidago rugosa is called Fireworks goldenrod for its showy display. It is more compact that many of the other species and has more blooms. The spread is more limited, making plants appear in heavy clumps. The wispy blooms look like fireworks displays in bright yellow hues. Butterflies frequently visit these blooms, creating good shows. This makes them ideal for a butterfly garden or a potted plant. Many of the species have been developed to be nonallergenic to humans. Those that have not may need to be planted further away from homes. This is because some species are known to cause allergies in humans. Most plants require minimal care and thrive if left alone in gardens. Partial sun and full sun are ideal light conditions for plants. This will give them enough light to grow rapidly during summers. Well drained soil is needed by the cultivated species in gardens. Wild species may be able to survive in soil that is more rocky. Fertilizers are often not necessary to achieve good blooms on plants. Spreading will occur if seeds are allowed to develop and drop to soil. If spreading is not desired, heads can be cut before the seeds form. Unwanted plants can be weeded out or dug up and removed if needed. Stiff stems are capable of withstanding higher winds in gardens. Staking is not needed in order to encourage blooms to flourish. In ideal conditions, the plant may grow up to six feet tall in lawns. For many, these bright blooms symbolize encouragement and growth. They may be given to show support after a loss or in a difficult time. It is often thought that these flowers can help reduce depression. Another popular meaning is that this flower can bring good luck. It can be used in bouquets wishing good luck or fortune to others. It can be combined with other flowers that stand for good luck. Yellow is thought to stand for creativity and for inspiration in life. For this reason, the blooms are a good choice for an artistic path. Solidago arrangements may also include other creative yellow blooms.